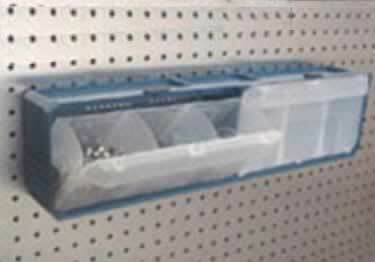 Get organized and stay organized with these tough grade polymer bins, trays, and parts organizers. Perfect for holding and storing nuts, bolts, hardware, craft items, and other small objects. I would like to know the dimensions of these products. The parts bins, the peg board jars, and the parts organizers (single piece and multi-bin) Thank you! I ordered these for my husband as a gift and he absolutely loved it. Very convenient and he says they stay out of the way. Very sturdy and would recommmend it. Thank you for the review. We really appreciate the kind words concerning this product.